Get rain and snow forecasts the quick and easy way with the Raincast - NOAA Home Screen Rain Probability and Percent Chance app. This app always has the latest weather information and the reliable 12-hour data is provided by NOAA. 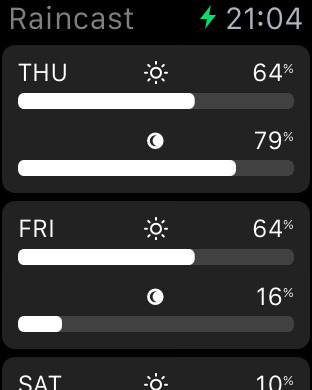 Raincast for the Apple Watch provides scheduled alerts with rain probability, a five-day rain forecast, and a Glance for upcoming rain chances. If precipitation probability is important to planning your day, whether for work or play, then get Raincast for the most accurate forecast. 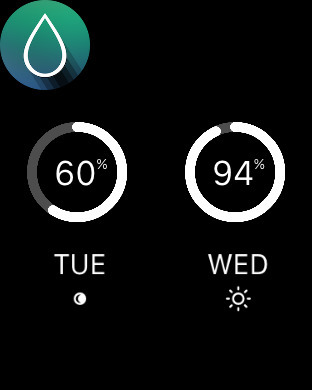 Receive rain notifications showing the percent chance and when to expect it. See at a glance the probablility of rain coming up. Check out the likelihood of rain in next five days. AppBrew LLC is an iOS app design development company based in Indianapolis, Ind. Their apps include Raincast, Medly, and BrewBarrel.